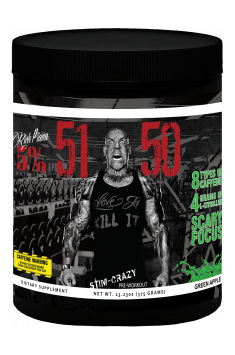 5% Nutrition 5150 is an extreme pre-workout stack in a series signed with the name of a bodybuilding legend Rich Piana. It is distinguished from the products of competition by maximal level of stimulation, obtained as a result of applying as many as eight various forms of caffeine, providing in total 400 mg of this stimulant in one portion. Vitamin B3 – also known as niacin. It is a vitamin considerably influencing physical abilities of the organism. It takes part in the metabolism of all nutritious substances, enabling efficient energy intake from these substances. As for the circulatory system, it is present in the production of erythrocytes, responsible for the transport of oxygen to working skeletal muscles, it also widens the lumen of blood vessels and stimulates venous-arterial flow. As for training abilities, the influence of niacin on the nervous system and psychological functions is also important. It positively influences well-being, has anti-depressant effect, facilitates going through tough moments. Niacin also has the ability to regulate lipid profile by optimizing the ratio of lipoprotein HDL to LDL. Vitamin B12 – in the supplement appears in the form of cyanocobalamin. Similarly to vitamin B3, it stimulates training abilities thanks to two mechanisms: by influencing energy metabolism and stimulating mental abilities. Cobalamin is an incredibly important coenzyme in two reactions of the methylation pathway, a process enabling deriving energy in an efficient way. Stimulation of this mechanism by supplementation with vitamin B12 allows to maintain high pace of energy metabolism. Cobalamin also takes part in the production of myelin sheath, thanks to which it has protective influence on the nervous system. Its supplementation is related to the improvement of emotional states and increase of cognitive abilities Moreover, vitamin B12 is present in the process of erythropoiesis, being one of the factors conditioning the production of red cells. L-Citrulline – an amino acid responsible for the phenomenon of „muscle pump”. It demonstrates the ability to intensify the synthesis of nitric oxide, which is a factor responsible for increasing the lumen of blood vessels. In this way, citrulline stimulates venous-arterial flow. It is related to the increased supply of nutritious substances present in blood for working skeletal muscles. Thanks to this, they may work more efficiently, having at their disposal a sufficient amount of energy substrates. Increasing blood flow allows to easier get rid of redundant metabolites, produced during physical effort. Moreover, the effects of the increased production of nitric oxide are conducive to regeneration processes. Beta-Alanine – in the preparation appears in a legally protected formula CarnoSyn®, enjoying popularity due to its highest quality of production. Supplementation with beta-alanine increases the concentration of carnosine, which is its precursor. Carnosine is a factor buffering acid-base environment in the organism. During physical effort it neutralizes the effect of lactic acid, responsible for the feeling of muscle pain, limiting efficiency. Increasing the synthesis of carnosine by supplementation with beta-alanine enables longer work of skeletal muscles without the drop of their efficiency. Optimization of acid-base environment also enables more efficient post-workout regeneration. Taurine – supports effort abilities thanks to many mechanisms. It stimulates the transport of creatine in the organism, increasing the efficiency of energy intake from phosphagen changes, which are its main source during short efforts, i.e. for example strength training. It also stimulates the functions of the nervous system, promoting metabolism of glial cells. It increases cognitive abilities, facilitates association of facts and memorizing. High concentrations of taurine are characteristic to intensively developing organism. Importantly, during physical effort, excessively low synthesis of taurine takes place, therefore its supplementation is the way to avoid effects resulting from its deficiency, which is a physiological response to intensive muscle work. N-Acetyl-L-Tyrosine – highly bioavailable form of tyrosine, which is a precursor of many neurotransmitters and hormones. Being present on the pathway of adrenaline and noradrenaline, it stimulates their production, which is related to intensification of physiological functions of the system, responsible for increasing physical efficiency. Tyrosine also constitutes a precursor for dopamine, which positively influences cognitive functions. It is also related to the center of motivation. Moreover, this amino acid is also a precursor for hormones produced by thyroid. Therefore, it promotes their synthesis, positively influencing the pace of metabolism. Choline bitartrate – provides choline, also called vitamin B4. It is a precursor for acetylcholine and promotes its synthesis. Acetylcholine is the main stimulating neurotransmitter in the human organism, it stimulates the majority of systems, increasing their efficiency. It is also a transmitter responsible for causing a molecular mechanism of muscle contraction, therefore its production conditions engaging motor entities in movement. Choline also has autonomous mechanism that positively influences physical efficiency. It is a donor for methyl groups, therefore its proper supply in the system ensures efficiency of energy processes. Caffeine – the most popular stimulant, applied in the supplement in as many as eight various forms, at the total dose of 400 mg. It ensures maximal stimulation spread equally in time, without rapid spikes or energy drops. Caffeine owes its powerful effect to two main mechanisms of activity. Firstly, it exhibits the ability to bind with adenosine receptors, without activating them. Since adenosine is a factor signaling fatigue of the organism, by blocking the access to its receptors, it inhibits signalization of exhaustion. Moreover, caffeine is a competitive inhibitor of cAMP-phosphodiesterase, which inactivates cyclic adenosine monophosphate to its inactive form by transforming it to a non-cyclic form. In this way, it increases the concentration of active cAMP in a cell, which intensifies stimulating effect of adrenaline in the organism. Summing up, 5150 by 5% Nutrition is an advanced pre-workout stack based on well-tried, both scientifically and in practice by sportsmen, substances, used in maximal doses. It ensures stimulation of physical efficiency, allowing to intensify training sessions and generate larger stimuli for development. The supplement is also a remedy for temporary lack of powers and motivation, making it impossible to perform training for 100%. One portion (one scoop) about 0,5h before workout. The preparation will also work well to maintain high energy levels for a longer period of time, for example during intensive work during the day or as support for endurance trainings. In such a case, I recommend dividing a single dose of the preparation into several smaller portions, taken for the whole time of effort every 2 hours. Ask yourself a question, what percent of the people is really doing everything to make their dreams come truth? And here is the place for company Nutrition 5%. It is possible, that among your friends, there is 95% of people, who start something and never finish. The goal was too difficult or impossible to achieve. But for the remaining 5% of people, that is not an obstacle. This applies to all areas of life, such as finance and business, the pursuit of happiness and freedom, family, sports, lifestyle, education and personal development. This is not an easy road and therefore only 5% of people are choosing to take up the challenge. 5% Nutrition is a company selling pre-workout supplements, diet supplements and sportswear. With its products, they enable you to be among these 5 percent of the exceptional people who achieve their goals and fulfill their dreams. Natural Flavors, Citric Acid, Sucralose, Silicon Dioxide, Yellow #5 & Blue #1. Yerba Mate extract - from the leaves of yerba mate (ilex paraguariensis), a drink popular in South American countries. The extract contains caffeine (as metaine) and is a powerful antioxidant. Teas and extracts of Yerba Mate leaves are slimming by causing a feeling of satiety and fat absorption, increase immunity of DNA through the binding of free radicals, reduce LDL cholesterol levels. In the sports supplementation, the ursolic acid contained in the yerba mate, may be important, as it is an aromatase inhibitor, capable of lowering estrogen levels of men, thereby affecting the aesthetics of the figure. Yerba mate extract is a component of fat burners. In combination with green tea, bitter orange and black pepper (piperine) it increases thermogenesis. Dosage: the lack of standards for daily consumption.